Kauai, Hawaii – Five months after the Kauai Marriott Resort on Kalapaki Beach was reintroduced after a major $50-million renovation, the adjacent Kauai Lagoons Golf Club is undergoing a major redesign of its own. In the meantime, the resort course is offering a rate of $85 and a $25 club rental fee for second or subsequent rounds when you play two or more rounds during your stay. The Hana Hou – which means “to do again” in Hawaiian – Discount Card is provided upon check in of your first round and can be used for up to one week. Kauai Lagoons is a Jack Nicklaus design that is receiving extensive upgrades. Currently 18 of the 36 holes at Kauai Lagoons are in play, consisting of nine holes from Kiele and nine holes from the Mokihana Golf Course. 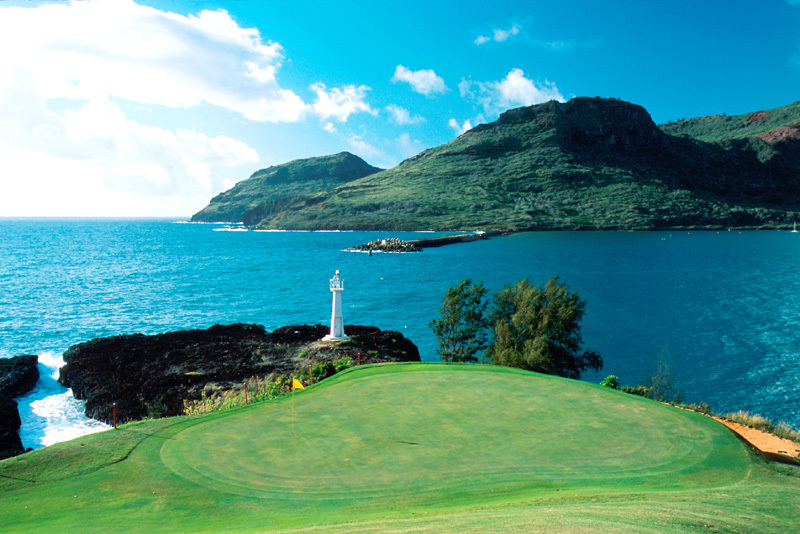 Upon completion of the renovation in May, the course will feature the longest stretch of ocean holes in Hawaii. The overhaul at Kauai Marriott included the refurbishing of a casual open-air restaurant, a newly built children’s pool to complement its signature 26,000 square-foot swimming pool, nearly 20,000 square feet of indoor meeting space and 60,000 square feet of outdoor event space in ocean, garden and pool settings.